Tigran Avetisyan, one of the most celebrated new east fashion designers of the moment, is currently showing his latest collection at Showroom Romeo in Paris. As is the norm in the fashion world, you would expect to see something new, but Avetisyan had other plans. In the new collection Avetisyan replicated designs from his own Spring-Summer 2014 collection. Avetisyan's signature coat is painted black with a slogan on the back which reads “Nothing Changes”. The whole of Avetisyan's Spring-Summer 2017 collection consists of twelve identical coats, which is his critique of the fast-paced cycle of fashion which never stops. “Like all of my previous collections, this one is a comment on the state of fashion,” Avetisyan says. “The main question I wanted to raise was what is the value of creativity in the now marketing-driven industry? Hence I abstained from designing altogether and focused on creating a strong image that will look nice on Instagram. The rest of the range in the showroom comprises mostly T-shirts and sweatshirts”. Just like Avetisyan's recent fake perfume ad Duty Free Pour Homme, the move hints at the persistent narrow-mindness of the industry in a rapidly changing world. 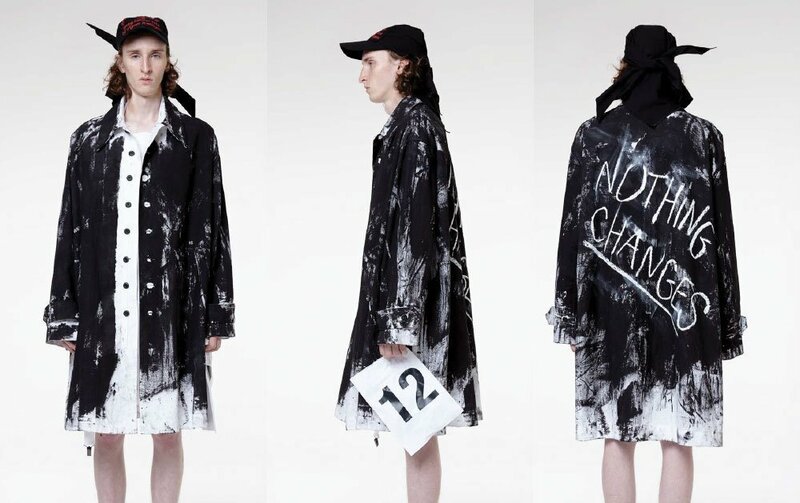 Tigran Avetisyan graduated from London's Central Saint Martins in 2012 with a LVHM scholarship on his CV, and relocated to Moscow to start his eponymous brand. His clothes are available through leading retailers worldwide, including Opening Ceremony, 10 Corso Como in Milan and SHOWstudio Machine-A in London.